Larry Lownds enlisted in the USAF in 1953. He served as an instructor and examiner in the Automatic Tracking Radar Branch, Ground Electronics’ Department of the Electronics School at Keesler AFB, MS. Upon release from active duty he completed his military career in the Air Force Reserve. Larry cross trained into the Air Transportation career field and retired as Chief Master Sergeant with 24 yrs of combined Active and Reserve service. He was recalled to Active Duty during the “Pueblo Crisis”; serving as NCOIC for aerial port squadron operations at Osan AFB, Korea. During the Cold War, Cuban Missile Crisis, Viet Nam War he supervised worldwide aerial port deployments. In civilian life Chief Lownds was employed as a buyer for Flight Enterprises, Inc., and TEMCO, Inc, both engaged in government aircraft maintenance contracts on McGuire AFB. 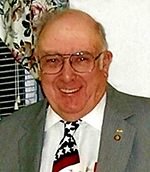 In 1961 he became a civil servant and held progressively responsible positions at Walson Army Hospital and purchasing and contracting management roles at Fort Dix. He retired as Contracting Officer. Larry served for 19 years on the New Hanover Township School Board; nine years as Vice-President. He is a life member of the Wrightstown Vol. Fire Co., having held positions from Fire Fighter to Chief. Larry is currently the Vice-Chairman of the Wrightstown Municipal Utilities Authority. He was honored by the New Jersey League of Municipalities in February 2014 by election into “The Elected Officials Hall of Fame” in recognition of over 20 years of service as an elected municipal official. Larry has been a Borough Councilman since 1991. He has chaired the Historical and Economic Development Committees. Larry is probably the most knowledgeable person regarding the 100 year history of military operations at Joint Base MDL. He has served as President of his Parish Holy Name Society and functioned as Church Organist for fifty years, was long time Secretary of the Ocean County Federation of Holy Name Societies, and is a member of the Knights of Columbus.